SR: If you could invite all the poets that you mention in your new book over for a party, what would you serve them and what kind of party would it be? Like, would you take them bowling? Pool Party? MD: I… Nope, I know what I would do. I’d throw a pizza party. Pizza party and we’d watch The Goonies. SR: It seems, in this book, that the body is made into a place where one can walk around. For instance, your brother walks through the tall brush of his brain where grief is the capital; in “Canoptic Jars” you remark “when I say I’m leaving the city, it must be my body I’m talking about.” There’s the sense that, when we turn ourselves inside out, there’s a city there. And Portland, OR is so important in your writing—what do cities and bodies have to do with each other? MD: Well, I feel a deep connection between the human body and the physical place where the body is at any given moment. And I think we have different experience depending on where that place is. But the city is a kind of heightened kinetic experience, I think. And the wildness of the city, the energy of the city reminds me of the jazz odyssey acid trip that my own inner life is. And so for me, that’s how the body and the city are connected. And I think our bodies, what’s going on in our bodies, our inner life, our souls are as complicated—and obviously more—but maybe a big city gets close to that ecstatic noise. SR: What does elegy do? MD: I think elegy helps us, not only survive pain, but it helps us engage in love. Interested in pizza, ecstatic noise, and/or the elegiac form? 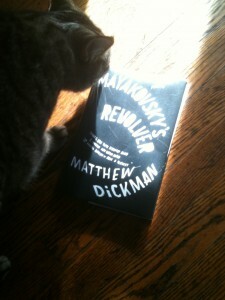 Mayakovsky‘s Revolver came out in October, you can read it. Have you already read it? What do you think? Talk to us in the comments section. If you want to know some things that I think, you can read my review, “Diorama with Dead Brother: Constructing Elegy in Matthew Dickman’s Mayakovsky’s Revolver,” in the upcoming winter issue of Sycamore Review.